Epic Mickey 2 fell apart almost the instant I put the disc in. It presents a wide variety of technical shortcomings, from negligible to impossible to miss. Conveniently enough, the tutorial covers the gamut of issues. Wandering through the wizard Yen Sid’s house, I learned about Mickey’s dodgy jumping, which animates fluidly and arcs unusually, making precision jumps hard to pull off. I honestly don’t get all the ruckus about it, but I’ll admit that his jumping is on the unusual side. I also learned about the game’s frame rate issues, which are rooted in Mickey’s magical brush. This brush is Epic Mickey’s hook, as it grants two powers: first, to paint and solidify translucent objects, and second, to thin and erase certain objects. In general, the game is good about not tempting you to paint too many things at once. However, if you spray paint in a wide arc, hitting everything onscreen, you’ll get to witness some frame rate chug. The paintbrush tutorial takes place in a starry void. I was also surprised to find no option for painting with a Wii remote and nunchuck, which was one of my favorite aspects of the first Epic Mickey. Player 1 is forced to use the tablet controller here, so you’ll aim with a standard dual-joystick scheme. 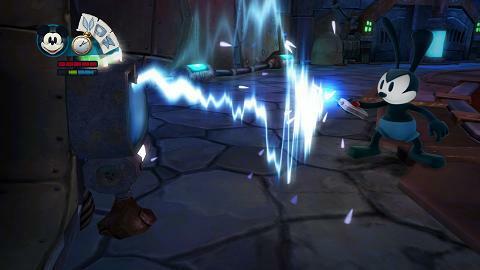 Epic Mickey 2 has a few core issues like those, but luckily, there are no outright glitches. Everything functions, even if how well it functions is questionable. So, the gameplay didn’t have any glitches to dissuade me from playing, but it was certainly boring enough to do so. After clearing the introduction, I found myself in a castle. Mickey ran into a sidekick, Oswald, and with him I was supposed to sort out a series of switch puzzles. Though I was assured the castle was crumbling, the gameplay that followed was bumbling, dashing any sense of tension. In a dank basement, I opened doors and painted wires so that Oswald could electrify something or other. While these puzzles hardly made me think, Gus the Gremlin kept yelling at me to look for a switch to pull or stuff to paint, and it always took me about a minute to find what he was talking about—sometimes, puzzle elements fit in all too well with scenic clutter. This sets the tone for Epic Mickey 2’s puzzles, which are more about looking around than critical thinking. Plus, throughout the game, Gus is always very vocal about what you haven’t found. Oswald’s shtick is powering stuff through electricity. I found him to be way more cooperative than I expected. On the bright side, Oswald’s AI is pretty good at helping you out, and he’s surprisingly talented at navigating jumps, even if he does slip up on occasion. It’s frustrating that he doesn’t add anything except tiny bouts of waiting to the gameplay, but he does perform admirably. You can also invite a second player to control Oswald by pressing 2 on a Wii remote, a feature I never tried. Either way, he’ll be there for every second of the game. Perhaps the final nail in the coffin for Epic Mickey 2 is its approach to Disney nostalgia. There’s no doubt that the content here is lovingly crafted, but it lacks the excitement of the first Epic Mickey. Leaving Oswald’s crumbling castle, I arrived at Mean Street, the hub for the game. While it underwent some structural changes since the first Epic Mickey, I was still largely familiar with the people and places. Mickey’s not a stranger in a strange land this time; he’s been here before, and that feeling persists, as most areas you explore are based on areas from the previous game. 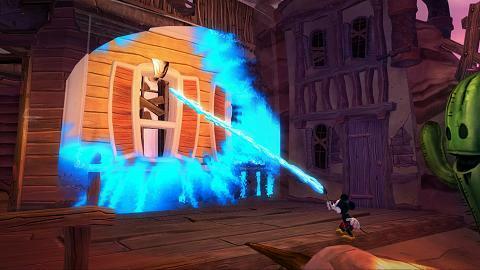 Epic Mickey 2’s locales mix vibrant and gritty colors in a pretty cool way. Granted, the only area in Epic Mickey 2 that is truly identical to its structure from the last game is the village of Ostown. Even then, Ostown is great at showing off the game’s creepy aesthetic. It’s a sunny and happy cartoon town torn apart by earthquakes; deep fissures separate pastel-painted houses, and toon-killing thinner bubbles from underground and gushes high into the cheery blue sky. Like the first game, Epic Mickey 2 loves to put naïve and chipper elements in grim situations, and it’s something I haven’t grown tired of yet. While I had plenty of options for lingering in these towns to pick up sidequests, I chose to breeze right through them and skip to the main attraction. If you dig talking to and helping out Disney characters, Epic Mickey 2 is glad to serve you, as each area will introduce you to new toons to assist. On the other hand, it’s always ready to throw you into a new platforming segment if you want. Anyway, that led me to Bog Easy, where the game starts in earnest. Here, a small orchestra maintains an otherworldly, uncertain feeling by remaining light on melody, while occasional banjo plucks remind you that this area is based on New Orleans Square. Much like the graphics, Epic Mickey 2’s soundtrack is always a mix of the friendly and the frightening. But it wasn’t until the giant walk-in museum exhibit, dubbed the Dioramas, that I realized how much I enjoyed what I was playing. Each room showcased a new scene, complete with moving bits and bobs to scramble between and jump onto. Rather than presenting a clear exit, each room tasked me with breaking or fixing its Diorama as I saw fit. 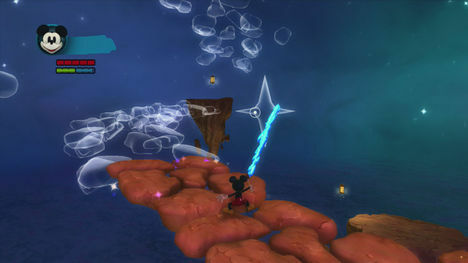 While Epic Mickey 2 rarely asks you to collect X number of things in order to proceed, finding the path forward almost always requires some exploring and interacting with various objects in various places. Searching and screwing with the machinations of the Dioramas was probably my favorite part of the whole thing, but every area in Epic Mickey 2 has stuff to find and play around with. Breaking a Diorama was fairly easy. At one point, I erased the tracks for an exhibit’s beetle with my brush’s thinner, throwing the entire operation into disarray. Thinner is tricky; often, it’s an easy way out of a situation, but on some occasions you’ll need it to open a passage forward. In order to get to the meat and potatoes of Epic Mickey 2’s platforming, you’ll want to look into paint as often as possible. Near the ceiling of the same diorama, I spotted frayed wires that could be fixed by paint—if I could only get there. The room had machinations dangling from the ceiling, which gave me footholds for platforming while they played their parts in the Diorama. 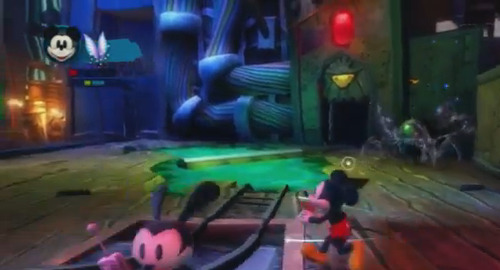 Environments in Epic Mickey 2 aren’t large, but they do offer a number of objects to paint and erase. I loved seeing where I could navigate by filling in or taking out certain objects. Don’t get me wrong, the painting and thinning system at work here is hardly deep or thoughtful; you either please some cartoon character or tick them off. But, if you enjoy experimenting in an environment and finding out just where you can go, this game has just the thing. It’s a style of platformer whose heyday left us when the Nintendo 64 knelt before the Gamecube. On the whole, Epic Mickey 2 is a series of those environments broken up by brief 2D platforming bits. You’ll sneak through the occasional (and often optional) stealth segment or take out a boss every now and then, but the game always mixes up the action rather than stopping it altogether. I wish I could say the same for the music. I died during the final boss, and when Mickey returned, all music had disappeared. The audio was largely cut for the remainder of that session, making for a weird and unintentionally lonely ending scene and credits sequence. Structurally, Epic Mickey 2 engaged me; technically, it let me down. The environments encourage exploration and experimentation. Pacing is an improvement over the first Epic Mickey. Fetch quests are optional this time around, and if you want to go back to old areas and complete a sidequest you may have missed, you’re free to do so. The music and environments are a strange mix of the unsettling and the happy. The controls are floaty, and this game could definitely benefit from Wii remote support. Performance issues include framerate slowdowns and music glitches. Epic Mickey 2 takes the great 3D platforming that made the first game fun and focuses on them entirely. It’s definitely a refinement in that sense, but when you throw in an unnecessary coop character and performance issues, I’ll stick with 5 out of 10. If you at all enjoyed the 3D environments from the first game, this is an easy recommendation. Purchased new in 2012 for $59.99. Each individual area in Epic Mickey 2 is full of crannies to find, and there’s a good amount of sidequests to take on at your leisure. I don’t have a problem with this price.